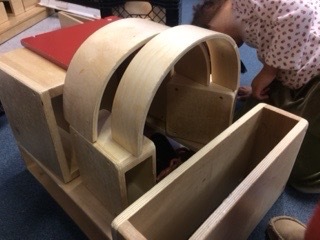 W wanted to make a house with a flat red roof. She worked with O, and continued to add pieces of different shapes and sizes. O decided it was no longer a house, but an apartment building. "A lot of people like this home," O said. Then the focus was on the area around the house. Shouldn't there be a highway near the apartment building? "It's going to need sidewalks," C announced. More construction ensued. 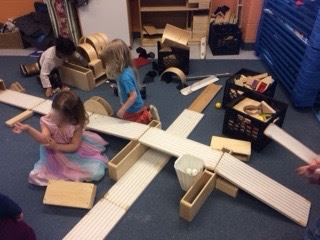 L suggested that the highway should have a bridge, with a road going under the highway. He became very excited at the way it was looking, declaring "We are building the whole world!" With this whole world in place, B wandered over and asked "Can I play family with these dollies?" Then the focus became all about the dolls [Duplo figurines]...how many could fit in the apartment building? How many would walk down the sidewalk? Maybe one or two would be on the bridge? M became very excited when she found two Duplo figurines that were identical - "Twins!! Look!!" O did not appreciate M's loud voice and reprimanded everyone with the words, "Everyone is supposed to be in bed right now!" With preschoolers, it starts with blocks but it ends with family. Always. 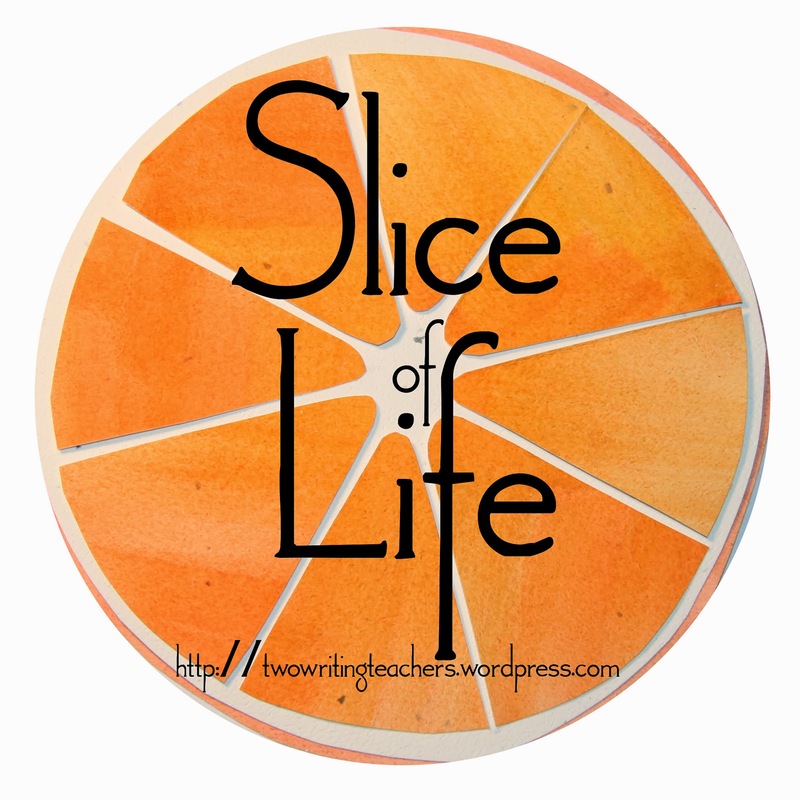 This is my last slice of this March challenge...spring break has arrived and I'm off to Costa Rica in the morning, celebrating our 30th wedding anniversary! There are many more things I would have liked to write about, but I will save them for another time. I hope that everyone continues slicing and enjoys this last week of the writing challenge. I'll be back for the Tuesday Slice of Life in April. Enjoy! 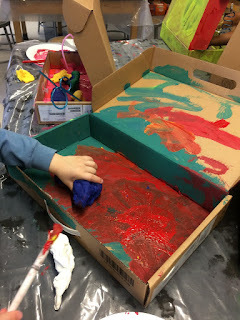 It's Intersession week at my school, wherein the early childhood students spend an hour a day in mixed age groups doing focused exploration on one thing...I'm working with our wonderful Art teacher Ms. Lane and a group of 10 three, four, and five year olds to create "Whimsical Worlds" in a box. 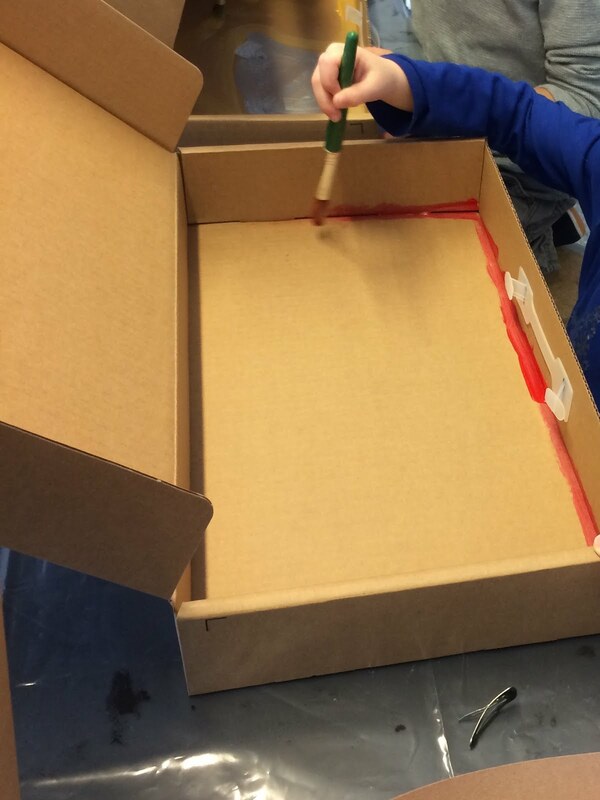 Day One - Everyone chose a couple fun paint colors, transforming the box, slowly but surely. Yes, whimsical worlds!! So much fun!! The March For Our Lives, the national march against gun violence, is this Saturday, March 24, 2018 here in Washington, D.C., and I know many people who are participating. (Tony and I will be headed to Costa Rica for our 30th Anniversary on that same Saturday; I am sad to miss the march and so very excited about our trip.) Many families from my school have connected about this important issue and will be walking together with their children. There have been so many tough conversations and strong opinions shared about this topic. One tough conversation topic is about when should we be talking about these hard issues with young children? When is it appropriate to discuss these things with our youngest learners? I wonder if one's perspective on this correlates with how sheltered one's own life is? Who falls on the side of preparing their children, talking about potential issues, opening their eyes to the cruelness of the world? Do these families have more history of violence or disenfranchisement? I wonder, how privileged are those who believe their children don't know about violence, don't know about racism, don't know about these hard topics, and we should not dare to bring these topics up? Or is the varied responses to this - when should we be talking about these hard issues with young children? - more indicative of each adult's individual comfort with having these conversations? Do many simply not know how to approach or what to say, and therefore choose to avoid the discussion, deny its need? In my classroom, I see preschoolers playing about real-world stuff. I hear them playing through real-world problems. I don't think children are escaping the cruelty of this world; I don't believe there is any way that they can. 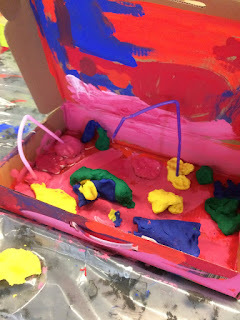 Example - there has been a huge uptick in gun play in my classroom these past few weeks. I believe this is precisely because of the tragedy of the school shooting in Parkland, Florida and our national conversation about guns. 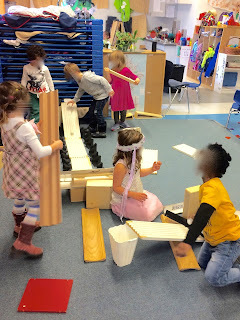 Just this past week, three preschoolers were "shooting" a block building that they had built. I saw the same thing after the attacks of September 11, 2001, when children built block towers and flew make-believe planes into these, toppling them to the floor. Children are like sponges, absorbing everything in the world around them - those tittering adult voices, those sad, frightened expressions on faces, that brief snippet on the car radio before a parent turns it off, the headline grabbing voice on the TV in the barber shop, the lunch counter, or car repair store. The cruel world weaves its way into their consciousness. And whoa to the young child who has begun to read - how can they miss these stories on newspapers, magazines, TVs, computer screens? If your child goes to school, your child is likely to hear about these hard stories from classmates and other students. Just as in the snippet about the block play above - friends will introduce children to these topics even if families are avoiding the conversation at home, even if families have walled off their child from the news. Our violent world is the proverbial elephant in the classroom. I don't see how it is possible to entirely shelter a child from these topics and I believe it is wrong to pretend that we can. What is better, to have them hear a snippet of something real and violent and frightening, and then try to process it entirely on their own, in their own head? Or to dare to speak truth in a developmentally appropriate way? We make a huge mistake when we avoid these hard conversations with our children. - what makes us feel safe? what makes us safer? and so many more thoughtful, unending, ongoing conversations that normalize the work of living and being together. These respectful conversations will help a child feel less anxious, more able, and more hopeful. Through such conversations, we'll move from a stance of fear into one of courage. We need to get children thinking about nonviolence. Our world needs this, now. I believe the sad truth is - we must dare to talk about it now. As soon as I arrived at school this morning, I changed around the dramatic play area in my classroom. I'm such a pro at these reorganizations that I only needed about twenty minutes to make it happen. Out with the suitcases and the travel theme, in with a restaurant! I set up the kitchen as one long galley against one wall for our many passionate chefs; I moved two small tables to the center of the area, draping them in tablecloths and setting them with dishes, to entice our hungry customers; I transformed the puppet show booth into a hostess stand, right at the entrance, so that we might welcome guests to our charming establishment. It may seem strange to change it just four days before spring break, but changing the area was more than overdue. 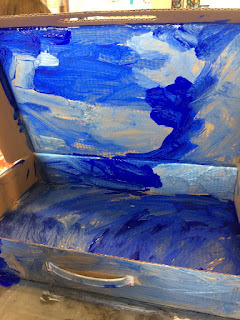 All three of us teachers (my two Teaching Residents and I) felt invigorated by the change - it was like a breath of fresh air to imagine new play and conversation with the children. 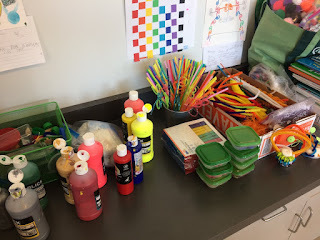 Also, I feel as if it gives us a chance to see what the children most like to do with the area, and we'll be more informed about the children's interests, as we plan the learning for the remainder of the year. The Teaching Residents are running a unit on Cooking, and this dramatic play area will be a fabulous complement to that unit. As students walked into the classroom at this morning's arrival, I met them at the hostess stand and said, "Welcome to the Big Cats' Restaurant, today is our 'soft opening.' Please come in and visit with us." Their eyes grew wide with delight and incredulity - everyone loves a happy surprise! 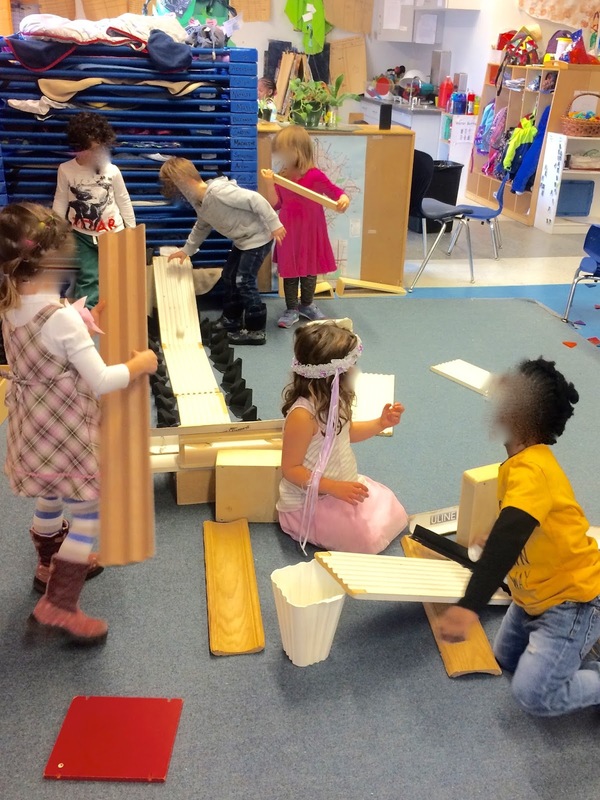 They immediately entered into play, searching for plates, cookware, pretend foods, and taking on various roles. (I was most amused by the two children who honed in on using the broom and dustpan! Every good restaurant needs this kind of teamwork!) Their excitement was palpable...yes, it was more than time to make changes to this area! At our morning gathering, I shared that we will brainstorm ways to grow this restaurant over the next many weeks, adding in their suggestions of what to name the restaurant, making menus, taking down people's orders, deciding what we should cook, and so much more...we will all work together to have a great time at the restaurant. One student exclaimed, "Hot diggity dog!!" and we all burst out laughing. That wasn't the only happy surprise of the day. Fast forward, I am home from school. Unbelievably, just after 7pm, D.C. Public Schools announced that schools are closed tomorrow. Snow day! Wow!! This. Day. Off. Is. So. Needed. It feels as if I have been given an extra day this week...my list of to do's has been bursting at the seam, and now I can be home and focused, with feet up, hot tea at my side, computer on my lap...oh my, oh my, oh my! I feel like a little kid, I am so excited. D.C. Public Schools are like the "little engine that could" of this area...all the surrounding counties will cancel school (as they have many times this school year), but D.C. chugs on, "I think I can, I think I can." This storm must be a doozy, to have them announce the closing the evening before. Oh my, it just dawned on me - I don't have to wake up early and search for the announcement! Is a "no alarm clock" morning - woohoo! This preschool teacher is smiling! Yes, she is! All I can say is, "Hot diggity dog!" A long, demanding day with so many facets. What teacher hasn't had that strange sensation of being in so many places at once, where you are present with a small group of students but thinking about the upcoming family conference or interrupted by an administrative task or challenged by someone's behavior? Can be a toxic emotion in a classroom. "I painted, and you know what we painted with? Apples!" "Those go like this, and those turn, and they fall down, and some balls flip...it's going to be the awesome way!" "It's a rock cross. Step, step, step - and you don't fall in. Come, follow me." "Can we have a ramp contest and see whose goes down?" Are you just going through the motions? What are you feeling? Paying attention to the internal state of the teacher. Yes, this is fragmented. Which is how I feel this Monday evening, fragmented. Wooh. Four more days until spring break! Today is my Mom's 89th birthday and somehow I managed to forget it. I remembered it two weeks ago and I remembered it this morning, but I didn't think of it in between. Therefore, my traditional gift of sending flowers and a card could not happen. Sadly, I know it doesn't really matter because my Mom has Alzheimer's and doesn't even know it is her birthday; she certainly has no worries about me missing it. As I brooded over this, I realized there were some very sweet years when she would get flowers and be so thrilled over them, phone me right away, and mention them yet again on the next week's call. I didn't realize how precious this was, at the time. I only know it in retrospect. Alzheimer's set in, and that sweet experience disappeared. Now, the flowers come and the caregiver has to draw Mom's attention to them. The memory or understanding of the gift doesn't make any impression at all. However, she loves to look at them and remembers clearly that flowers are pretty - and every time she looks at the bouquet, they are new to her again. "Oh, look at the pretty flowers!" This brief, repetitive joy is enough for me and why I will still send flowers to her, arriving as a belated birthday gift. Let's get back to this morning...certainly, I had to call her and wish her happy birthday! A simple phonecall would have to do. I called the house and my Dad called her immediately to the phone - "It's Maureen, to wish you Happy Birthday!" Mom confusedly says into the phone, "Happy Birthday?" I said, "No, it's YOUR birthday, Mom!" and immediately launched into song, Happy Birthday to you! "Oh, thank you! I will remember this always!" It's mid-month in this blogging challenge and I am so aware of how my slicing ideas are so totally bereft. Time, too, is ridiculously precious - this must be the craziest March since I began participating in the challenge seven years ago. No time and no ideas do not a good slice make! Ha! Yesterday's post was written on the fly, a "place holder" simply posted to ensure I was making a post for the day, and then I quickly squeezed in time to comment on three others. (The good news is...no one commented on my post yesterday - ha, my goal of invisibility for that particular post was achieved!!) My hope is that I am absolutely alone in this sad type of blogging, however I suspect that this rudderless, pointless, 'meh' kind of writing hits everyone at some point, and, goodness knows, writing for 31 days in a row shines a real focused light on the deprivation. Today, Saturday, looms quiet and I thought I'd just ramble onto this page and see what emerges. I am thinking about beginning teachers, novice teachers, first year in the classroom public school teachers. Whew. My school is a residency school for a teaching alternative certification program, meaning we have maybe a dozen Teaching Residents working alongside lead teachers; next year, these "emerging teachers" will be the teacher of record in their own classrooms in other schools in the city - i.e., first year public school teachers. I've been working with Teaching Residents for eight years, working alongside them in my preschool classroom. I feel "intellectually" aware and savvy of pretty much all things new early childhood teachers experience. Two years ago, my son became a Teaching Resident (not at my school!!) and he is now, much to my amazement and delight, a first year teacher in a public school - unbelievably, he is teaching prek-3, just like me. Some days I just want to pinch myself! How can my life's joy and passion be the same as that of my child's? but, wow, teaching is hard work! Teaching as a first year teacher is excruciatingly hard at times. Being a parent of a first year teacher is a pretty wild ride. Honestly, I can feel myself aging this school year! When I listen to his heartbreak, I wonder - What exactly did he say? How come he couldn't make amends? What causes us to be thoughtless? These 'slips of the tongue' are so ordinary, so human, and so horrid. We're living through one right now. A colleague received a text that was intended for another colleague, and - here's the heartbreak - not only was it written ABOUT the colleague who inadvertently received it, it was offensive and hurtful. How will they ever make amends? How will the beautiful and important work of teaching resume? Teaching is hard work...you team with people that often are not your favorite folks and you have to make it work. I often joke that working on a teaching team is like being in an arranged marriage, one where even your children are chosen for you! It's not like you are sitting at a computer terminal with your back to the other person, hopeful that your one meeting together is over quickly. No, teachers spend their daily life so close together, mired in lots of social-emotional issues, communication problems, family discussions, thought-provoking strategizing, planning, planning, planning...working together as teachers in intense. Truly, intense. We plan to have a restorative circle about this. We will now put into practice what we try to teach children - how to care for one another, how to be respectful, how to make amends. Today started off with one bad surprise after another. Getting ready for work, I put on my last pair of clean socks and my heel when right through one of them. I grabbed my phone from where it had been charging all night and it had no charge whatsoever. At the metro station, I scanned my metro card but the turnstile did not unlock...I almost flipped over the outstretched arms of that machine - oh my! Sitting on the metro, I hear my stop announced; I stand up to leave my seat, but my seat mate does not budge to let me out - I am confused momentarily, only to look down at him and realize he is sound asleep...I tapped his shoulder, woke him up, and raced out of the train, almost missing my stop entirely. I walked to school from the metro station in freezing cold wind...isn't it March 14th? What in the world?! As I walked along, I found myself thinking about how hard it is for young children to handle changes like this...especially, young children with special needs such as autism spectrum. How do you ready them for the unexpected? Every day is a surprise, really! Every day is filled with the unexpected. And some days, it is just one thing after the other. You do what you can do to have routine, patterns, organization...but the best-laid plans go awry. Perhaps the best thing to do is find a way to respond to these changes in a soothing way. For me, it's laughter. I try to find something funny about the situation, I try not to take myself too seriously...and, honestly, I think my flip over the turnstile would have been so funny! Our school has a significant increase in students requiring occupational therapy for writing in first grade. What can we do in kindergarten, pre-K4, and pre-K3 that would decrease the referrals? This is such a minefield of a word for me, as a preschool teacher. I was told that there is a very big gap between what is expected in first grade and our developmentally appropriate practice in early childhood. I was told that after kindergarten, 60% of a student's day is spent writing. how do we know that first grade expectations are reasonable? why is it that the early childhood curricula should change? should be modified to meet this need? how do we know this is the right thing to do? 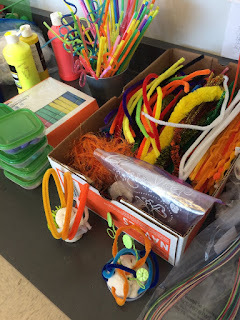 Please don't get me wrong - there are a lot of developmentally appropriate ways to encourage pre-literacy...ways to build fine motor muscles, ways to encourage letter recognition, ways to nurture both reading and writing. 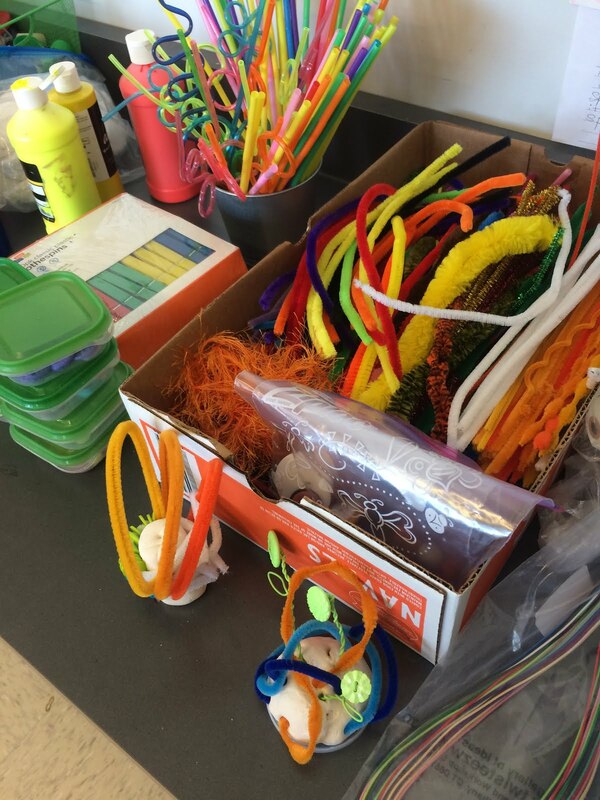 There are great ways to do all of this in the midst of a play-based, exploratory curriculum. I am game to think this through, to consider ways to enhance our curriculum. how is it that the increased need for occupational therapy reflects on the early childhood years? shouldn't we be questioning what is being expected of our elementary students? "Where childhood is cherished, children flourish." Many days, public school seems far removed from this dreamy description. Today is our 30th wedding anniversary...Tony and I, unbelievably, are celebrating 30 years together. I feel so blessed, so lucky, so happy. Way back when, when we got married, I'm not sure I imagined 30 years...that sounded outstandingly far away. Yet, here we are, 30 years in and hopeful for another 30 more. May it be so! I'm not writing much today - my gift to myself, my gift to us. Just savoring this accomplishment. Love rocks! Then, a minute or so later, he clicks the sound off. There is something so sublime, so nourishing, so lovely about sleeping in. My fast-paced, full teaching days have been coupled with busy weekends and I've had this sense of unceasing push and pull. Then, finally, I land with this incredibly soft, luxurious discovery: I open my eyes just barely and I see sunshine peeking around the curtains, and I smile and roll over and close my eyes again, submitting easily into another deep, rich snooze. What power is sleep! Energizing, rejuvenating, delighting. Saturday morning, I love you. I'm on a classic quest - finding that elusive balance. My dear husband is retired, and I have several more years before that will be true for me, as well. His easy paced days are a sharp contrast to mine. His retirement has eased my life in so many beautiful ways - he takes care of meals, laundry, house repairs, cleaning...he drives me to and from the metro each day. Yet, I continue to look for ways to bring our two lives more in alignment...while teaching. Put me in a room of preschoolers and I have a blast...let me follow their lead, hear their wisdom, watch their problem-solving, feel their love, joy, and energy...let's dance, sing, build, draw, read together. expected to make more and more and more planning details, with increasingly less flexibility or autonomy for individual classrooms...less wiggle room for that special book that suits the conversation or play that organically came up...the goal being to have set plans for the school year - i.e., teaching the same way every year, rather than knowing your kids and running with their interests. questions, such as Why should the children study this? What's the larger goal? What are we hoping they'll discover? What are the children wondering? Yes, it's been a tough week, a tough couple of weeks, a tough school year. But I have Saturdays. I want, simply, to teach. It's time to add a little something new to the block center...time to break out the balls and ramps! Oh, what fun we've had this week! The ramps are wood boards, pieces of moulding from house construction...they are about two feet long. We have a few cardboard ramps from moving boxes. The balls are lightweight plastic golf balls (no one gets hurt if one gets thrown! )...I have a couple dozen of these, so there are no sharing issues. Day One, I cycled the children through in small groups, giving them 20 minutes each. 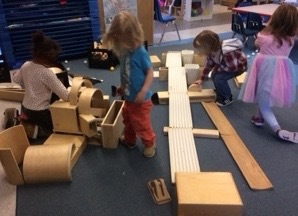 This open-ended, loose part play is so seductive for preschoolers - everyone participated, everyone wanted to continue playing when their small group was over, and everyone loves that these new toys will be a part of the block center henceforth. "I'm searching more stuff to build it." "We want these to go down there." "This is long, long, the longest!" "Look at all this building stuff." "I'm blocking the ways because the balls might run off." "We roll this into this catcher thing and it catches this." "The balls keep falling off!" "One ball came off but the ramp was really huge and I didn't want it to fall off." "I made a slice and stairs it could go on." "Can I play with you?" 1. I am alive and healthy. 2. I have a husband who I love dearly and who loves me back. 3. The day is basically over. 5. Yoga class made me feel so much better, and reminded me to write gratitudes. 7. I took Monday off because it is our 30th anniversary. 8. Tony and I are going out of town for the weekend. 9. I have brownies in the oven. 10. There is ice cream in the freezer. Bonus: This counts as my slice of life today. My school is a Teaching Residency school, where most classrooms are led by a lead teacher (or "master teacher," not a term I'm particularly excited about) and a Teaching Resident (a novice teacher). Teaching Residents work alongside their leads for an entire school year, while simultaneously taking evening classes towards their Masters in Teaching, and then they move on to be the "teacher of record" in a classroom of their very own next year. It is an intensive process! A couple times during the school year, we have "Resident swaps," where we assign Residents to work in a different age classroom, so that they might have some exposure to a different grade level. We are a community of teacher learners, so it is good to mix things up and hear everyone's reflections afterwards. - the song, "Three Little Birds"
It is delightful to me that this is their school world - nothing but fun, fun, fun! We had a great time with Mr. Smith and I think he enjoyed his day with us immensely. as I walk, walk, walk? when you run, run, run? Did I leave a bit late? Will I ever be lighter? That's what visits are about. maybe I can consider that done?